Share with your fellow Consumers! Part 2: Heap Big Trouble. As we discovered in Part 1 of this wade through the history of the comic book muck monster, 1971 was a busy year in the swamps. Three bog creatures emerged that year, the first of them being The Heap, who surfaced in March in the second issue of Skywald’s Psycho magazine. 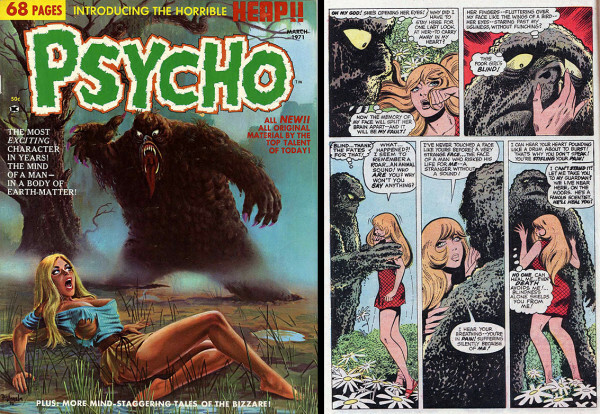 The Heap as he appeared on the cover of Psycho magazine #2 (Skywald, March 1971), and in colour from the pages of The Heap #1 (Skywald, September 1971). 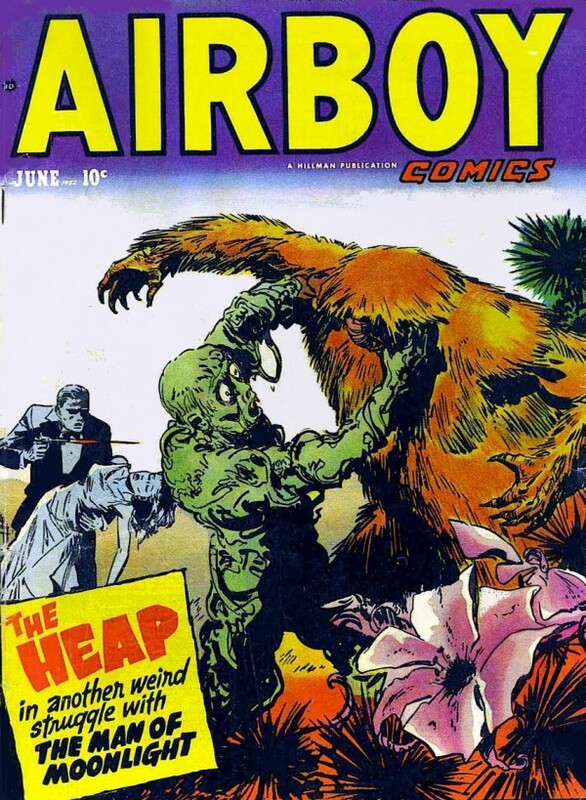 After WWII, the rise in popularity of the horror comic meant that The Heap would occasionally displace Airboy from the cover of his own title. But as we also discovered, this Heap wasn’t the first shambling swamp creature to bear that name. Created by writer Harry Stein and artist Mort Leav, the original Heap first appeared in Hillman Periodicals’ Air Fighters Comics #3 in December 1942, and was the reanimated remains of German WWI flying ace Baron Eric von Emmelman, shot down over a Polish swamp in 1918 (and if that name sounds familiar it may be because Baron Eric von Emmelman also appears in the novel The Bloody Red Baron, part of the Anno Dracula series by Kim Newman, where the pilot and several of his contemporaries appear as vampires). The Baron’s body remains in that Polish swamp, decaying and intermingling with the vegetation that encases it, until some lingering spark of will (and a little help from the nature goddess Ceres) reanimates Emmelman and The Heap is born, emerging from its swampy womb in the early years of WWII. As Air Fighters Comics was primarily a propaganda title, The Heap’s early appearances had him embroiled in the war in Europe, initially fighting the allied forces but soon turning on his fellow Germans. Shortly after the end of WWII, Air Fighters Comics was renamed Airboy and The Heap became a regular back-up feature. With no Nazis to fight, The Heap took to mindlessly wandering the planet, helping those in need (often by accident) and battling other monsters. Something of a brute savage, this Heap lacked the pathos that was to characterize the later muck monsters, apart from a few stories where it was teamed up with a child named Rickie Wood, whose remote control model biplane stirred memories in The Heap of its former life. 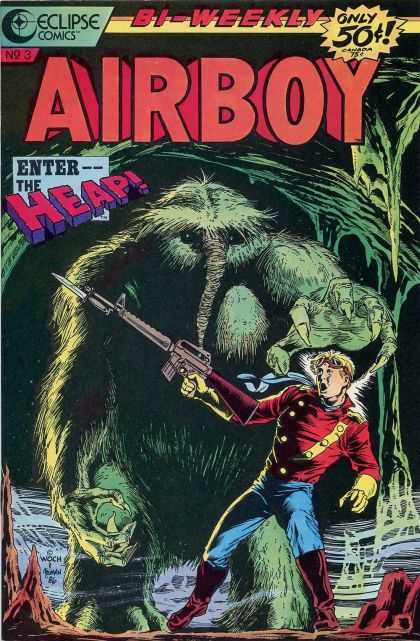 Airboy’s final issue, volume 10 #4, was published in May 1953; it wasn’t to be the end of this version of The Heap as we’ll see later, but things were to go quiet in the swamps for a while. Skywald’s Heap, Jim Roberts, was tormented by what he had become and searched constantly for either a cure or a way to die. Skywald’s 1971 Heap was the creation of writer Charles McNaughton and the artistic talents of Ross Andru & Mike Esposito (the penciler-inker team that had defined the look of Wonder Woman for DC during the 50s and 60s and did significant work for Marvel in the 70s on most of their Spider-Man titles). Though similar in appearance to the Hillman beast, this Heap had a different origin and identity to his earlier namesake. 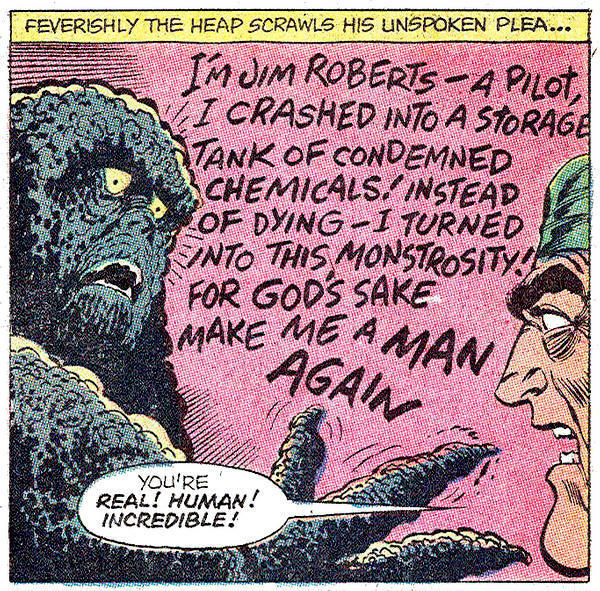 In Skywald’s story, a pilot called Jim Roberts is mutated when he accidentally crashes his cropduster into an Army toxic waste dump, becoming a thing composed of slimy green matter that can regenerate if damaged. Like the Hillman monster, the Skywald version is mute, but unlike its predecessor, this Heap retains its human intelligence and so we can be party to the angst and torment that are the constant companions of the man within the monster. After debuting in Psycho #2, The Heap remained a regular in that magazine until issue #13, as well as getting its own one-shot, The Heap #1, in September 1971. Psycho magazine made it to issue #24, published in March 1975, after which Skywald went under, taking their Heap down with them. It may still be down there somewhere, but so far there are no signs of any bubbles. Hillman’s original 1942 Heap fared a little better. After thirty-three years of dormancy, it emerged again in 1986 when Eclipse Comics acquired the rights to some of Hillman’s characters, including Airboy and The Heap, and started publishing new stories as well as reprinting some of the original Air Fighters stories. This resurrection lasted until 1993 when Eclipse also sank, after which the rights for the characters were picked up by Todd McFarlane and Image Comics. McFarlane’s reimagined Heap was a murdered bum named Eddie Beckett who becomes encrusted with dirt and garbage thanks to a bag of neoplasm (the stuff Spawn is made of). 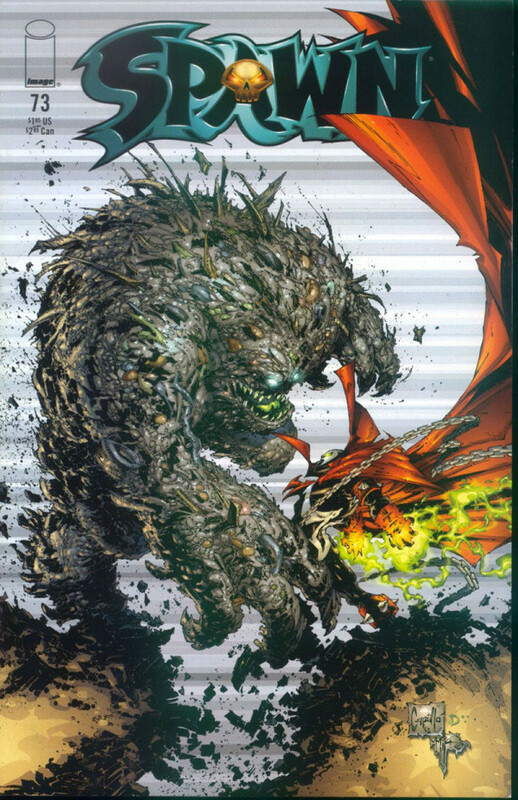 This was a muck monster for the big city; a construct of garbage and urban decay that first appeared in Spawn #72 in May 1998, making it onto the cover of the following issue. In his battles with Spawn, The Heap has swallowed him and in the process transported him to Greenworld, a mystical representation of nature. Just in case your head hasn’t spun all the way around yet, Moonstone Books published yet another The Heap #1 in 2011. Though described in the credits as a concept created by Charles Knauf for Moonstone, this Heap shares an origin story with Hillman’s Heap but resembles the most recent incarnation of Swamp Thing (also first appearing in 2011) in a way that must have caused some involuntary twitching down at DC’s legal department. There’s also the slightly random inclusion of some Norse mythology to explain this Heap’s existence, which may have been an attempt to add a unique element to this derivative elemental’s mix. Moonstone’s version of The Heap – issue #1 sketch cover variant and the cover artwork for issue #3 which I’ve never been able to track down in the flesh. Advertised as a 3 issue miniseries, only #1 ever seems to have appeared (in 2 cover variants). 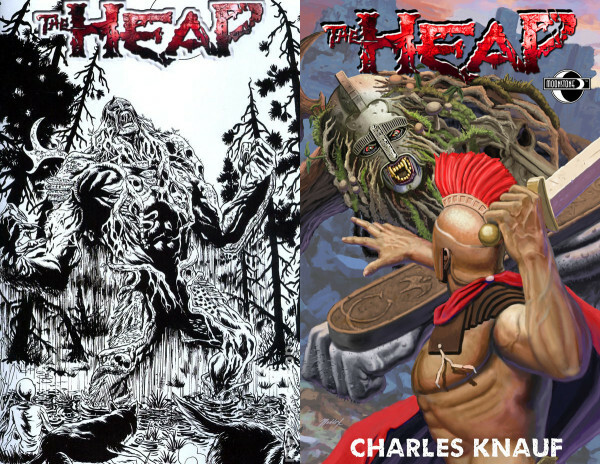 The cover artwork of issues #2 and #3 appears in the back pages of issue #1, but that seems to be all that exists of them. The remainder of the series was intended to be available by digital download via comixology.com, but only issue #1 appears on the site. Issue #3 of Eclipse’s Airboy relaunch sees the return of The Heap. The resemblance to Marvel’s Man-Thing is clearly evident on this cover. As an interesting aside, back in the early 80s, after his success at reinventing Marvelman for the modern era, rumour has it that comic guru Alan Moore was in search of an American comic character to try and repeat that success. He’d supposedly settled on The Heap as the subject for this experiment, but before he made any kind of move in that direction he got a call offering him the writing gig on Swamp Thing. 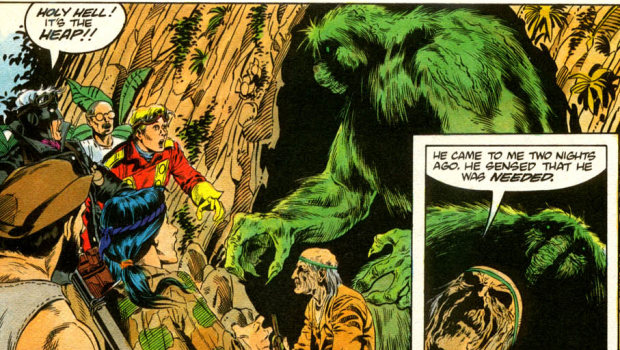 Even if that story is apocryphal, it’s intriguing to speculate on what Moore might have done with The Heap, especially when you consider that many of the elements he brought to Swamp Thing were echoes of both Hillman’s and Skywald’s creatures. At the time of writing, Spawn is the only ongoing title with a Heap (not currently active but also not listed as deceased for that title); there’s no guarantee the character will ever return in Spawn, but after four incarnations spanning eight decades I very much doubt we’ve seen the last of The Heap. Coming in Part 3… It’s A Man-Thing. The Nigel Cole is an ancient Welsh biomass, consisting mostly of hair, tea and cheese. Usually dormant, it does have periods of intense activity. It wrote the comedy fantasy novel "Last Exit Before Trolls Book 1: Swimming with Toasters". This occurrence of The Nigel Cole did not direct the films "Calendar Girls" or "Made in Dagenham". Nor should it be confused with the similarly named and almost as hair-covered Northern biomass The Cheryl Cole.